I've been trying to reconcile the counts across market, and may have found a solution tonight. Each market gives a bit different appearance, and readers know I've referred back to RUT several times, which argues that the next low (assuming the market makes a new low) will most likely be a fifth wave and lead to a larger rally. COMPQ seems to suggest the same thing. A quick look at COMPQ first -- if the wave labeled as blue 4 exceeds the invalidation level, I'll consider switching it to the more bearish count of black 1 and 2. Next, the INDU, which is much stronger in appearance than most other markets, and is giving the impression of a large triangle. RUT isn't shown, as I didn't have time to update the chart, but readers can refer back a post or two for why I believe RUT's correction was a fourth wave. So how to reconcile all these markets with SPX? 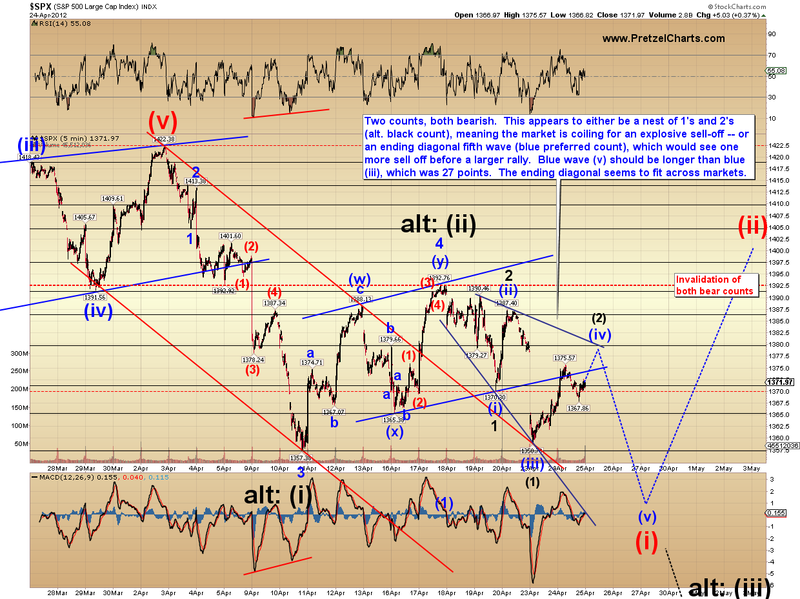 Well, how about an expanding ending diagonal fifth wave? This seems to fit not only the pattern, but the current patterns and expectations of other markets as well. 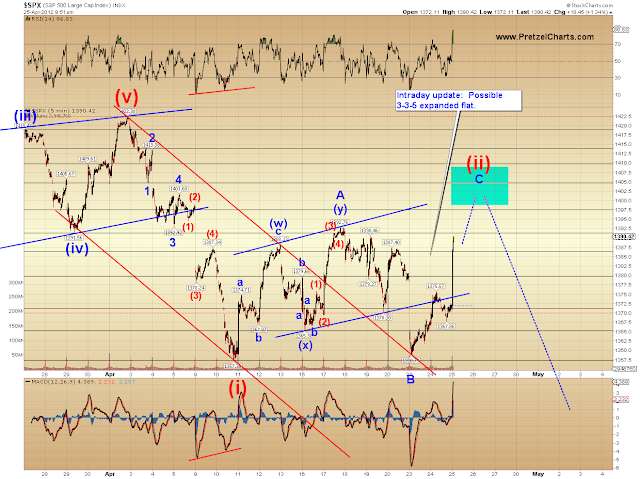 As such, this is my preferred count for SPX, shown in blue below. 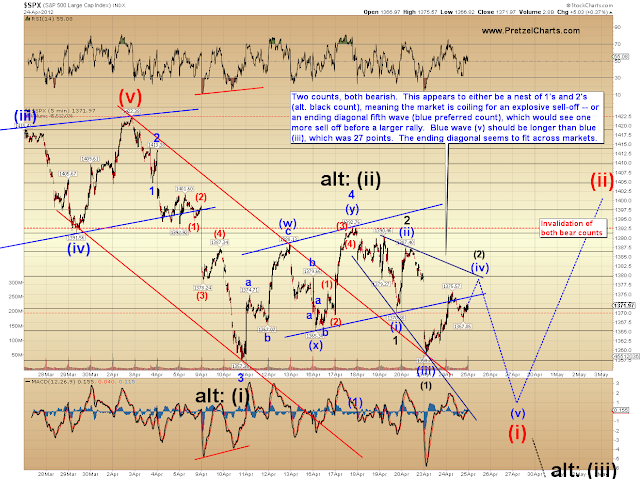 The more bearish count, currently labeled as the alternate, would view the present decline as a nest of 1's and 2's. We'll have to see if other markets invalidate their counts -- for example, if INDU invalidates the triangle, then we can seriously consider the mega-bearish 1-2 count. 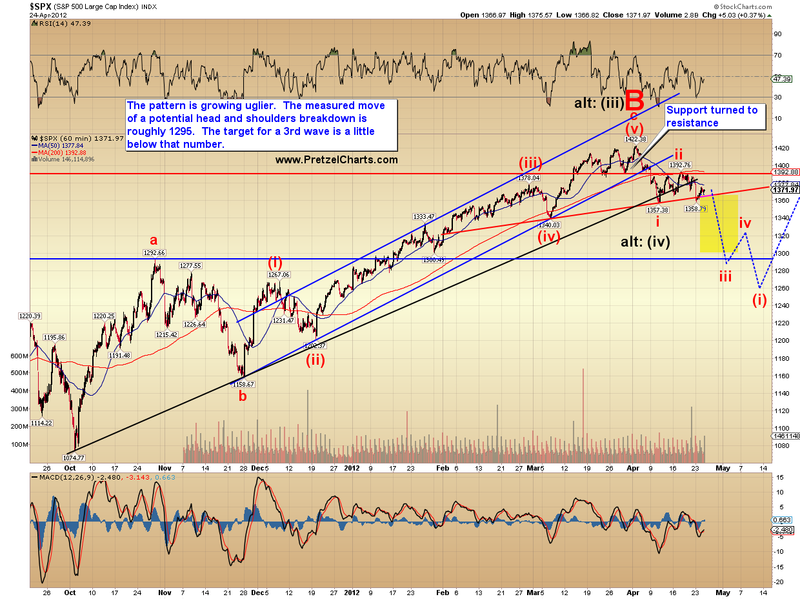 For contrast, here's how the more bearish possibility would look. Currently, this doesn't reconcile as well with other markets, but we'll keep watching to see how things unfold. The appearances could all change tomorrow. The alternate (iv) count still can't be ruled out, and might end up marking the next low (I view it as quite unlikely that the market's bottomed already -- too much overlap in the wave). In conclusion, the market still has a few questions to answer to bring more clarity to the structure, but I'm still favoring the idea that new lows will be seen, likely this week. Further, given what's in the charts at the moment, the ending diagonal currently reconciles all the markets fairly well. Trade safe. Good Morning PL...excellent job... my best regards to you and the family. Hey J - most likely a tank after the Fed echos the ECB and says they've turned off the machine and want to see if this is a soft patch or a larger slowdown. Again, all the easing does is kick the can in the hopes demand improves. Shorted euro overnight via limit order in E7M12 @ 1.3230, will short more if it goes higher. Thanks for helping us in addition to caring for your family. Went to the funeral of a former co-worker recently. I big turn-out. She was a sweet person who probably never made an enemy. Despite the loss, funerals do offer a chance to catch up with old fiends. with you there, reversed and long from 1383 es. Great calls last several sessions, btw, congrats! Summanab*tch, I don't know how I missed this earlier. Well, actually I do. Anyway, refresh your browser and check out the last chart I added on the update. Possible expanded flat. Okay, I really have to run now. EW question on guessing targets. 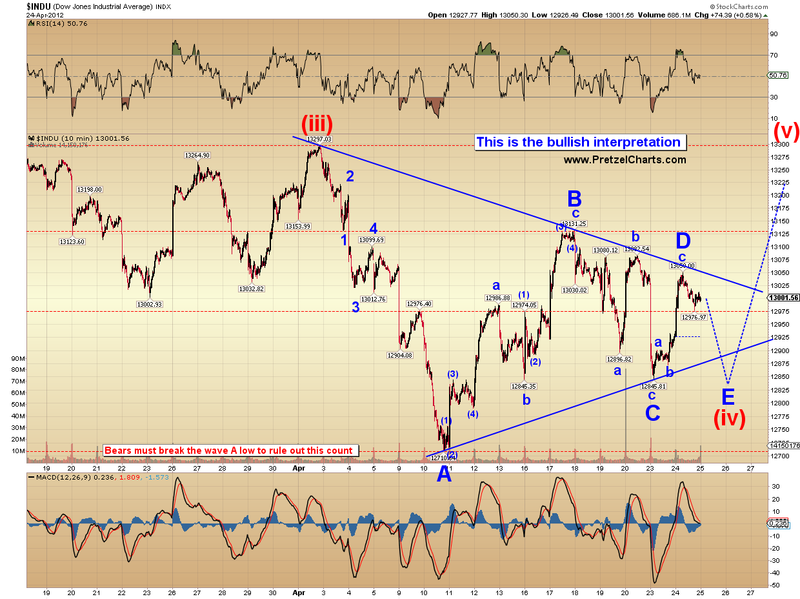 If the triangle on the INDU in chart 2 is happening, how do you work out the target for the rally? Is it theoretically, the distance from (iii) to A and then add that to E? Does that make it 13450? Fade day...Isn't there a t-bill sale tomorrow?...They need equities lower (in theory). My condolences, PL. You're quite the trooper for still managing to write given your situation. is there an E building, not sure about that. either 1.27 or 1.618 times length of 3 to 4 (in this case I would use A to C), or length of EW1. So the 1392 level for the invalidation of both bear counts is no longer a consideration? The target blue box shoots past that level. It does appear to go down with the red clouds and up with the green. Thanks anyway. I am at work, drove after I covered. Key resist levels in SPX 1390 and INDU 13100. Both battered and bruised but holding. I suspect they'll go away and gather more strength for more pops at those levels. We aren't in a down trend yet so keep an eye on those levels. Doesn't 2 to 3 have to be the longest move? Ideally, but as long as it's not the shortest it works. This is meant to be anything to trade off of. Wave 4 just looks wrong to me, and i of 5 was a stretch to get it to count. Just something to spark ideas, maybe. Something odd just struck me. The NDX Sochastic MI is low towards the 'buy' zone, INDU is high towards the 'sell' zone and SPX is hovering in the 'Idontknowwhattodonoextmidzone'. So what gives? You could call three separate scenarios based on those three readings, up/down/sideways, weird or what? If this is 4 then 5 should exceed the prior high and kill the 4th wv triangle but confirm the flat. It's all to play for. Same reasoning in INDU, same result. PL's flat would confirm 'down', a triangle, 'down-but-not-yet-and-youll-make-a-lot-more-money'! Either way we should be shorting very soon right? Everybody needs dreams...That's my dream by the way...confirmed by Rorschach. So rally back to 138ish and then fed minutes come out for wave III? The more I look at SPX MM the more I see a nice abc wave to A, a typically messy 'B' wave then this lovely sock it to 'em 'C' wave which has shocked everyone... just like it does. So, I'm definitely on the side of a flat 51%/49% in favour. At the moment. Alright I gotta go drop my car off for a service. Out of Amazon bear call spread, into additional spy bear call spread with short at 139 fri expiration. Still holding spread with short at 137/long 138 friday expiration, and still holding bear calls on COST and RL. All baby sized positions. Give people random pictures or numbers and pretty soon they start seeing patterns.. in whatever field you like including market charts!! True, modern psychology confirms... humans are useless at discerning randomness, we aren't built for it. AAPL (they make iStuff by the way) had to make their iPod shuffle less random to please people who complained when they say heard the same tune twice in succession, which is perfectly possible in a random environment. Humans are weird. There's a lot of wealthy people around, all due to randomness, they won the lottery..
Scratch that - FOMC statement release at 11:30 CST (10 min.) and press conference at 1:15 CST. I always thrived in disorder (prolly ADD rearing its head, a defect), hence my inclination to, and relative calm in emergent situations. But then again, that calmness was only the result of applying procedural algos to elemental observations...Pretty cool analogy about "shuffling" -- how it's not random after all...I did not know that. Tonight, I shall amaze the wife with that tidbit. GLD broke through 3-1/2 year-old support trendline. We'll see if it holds. For those RUTrs our there, it's hugging the trendline until something happens...most likely the Fed conference at 2:15 EST. I'm betting (via TZA) that it will drop like a rock however stop-limits are in place. Four touches of the lower trendline and the 300 MA in the last 4 months, which are now traveling together - a close below would not be good and would confirm bearish 50/200 cross IMO. I know you've discussed this before, but I can't seem to figure out how to get the ES to quote on Scottrade. Thanks. Talk about a whipsaw. That's was enough to break your neck. Anybody else having trouble with where "replies" are posted? Over the past coupla days, they have not always been posting under the comment I am replying to but rather posting at the top as a new comment. Sometimes they do, sometimes not. you are short at 84 area looking for 89? Anybody with a clue why the Euro is not going down? It is trading below its intra day upward trendline yet it seems to be showing quite some resilience with buyers pushing it up every time it approaches 13180 level. Anyone has a clue? One thought has been the repatriation trade of dollars to euros. Not my opionion but what some folks are floating around. PL I wish you and your family the best. My prayers are with you. God bless. third (and final???) test of 80.25? I use this chart as a general directional guide if 80.25 breaks. Howdy....out all morning, have some Nenner updates. Will post shortly. Nice charts Lena - thanks for sharing. What in the world did he say that caused the small bounce? Markets continue on a sell signal....close above 1387 and 2711 would be buy signals which could lead to test of the highs. Nat Gas...continues on a sell signal .....buy on a close above 2.09. Addendum to his daily......"For those who bought ECA, we want to take profits"
Bob_E when you get a chance please do share your insight today as to where you feel CVX is at in W4. Thanks! I noticed the same thing...like the kids are back stage with "monitors" for their "safety". How does that relate to SPX. 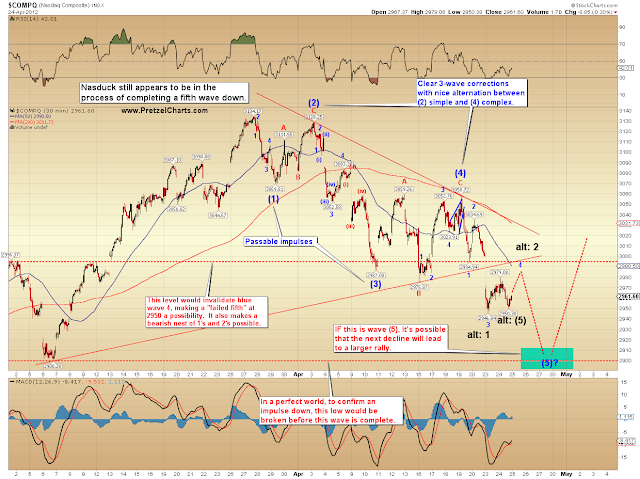 No change.....still think a complex wave 4, then down into five. ExxonMobil raised their div today by 21% and their earnings due tomorrow...CVX due 4/27. Those are RT on the ES. That difference btw the futures and cash seems to vary day to day, from what I've seen between about 4-6 points. DM, what did that pop on SPX do to your count for the day? Someone posted a vid the other day of guy doing an update from the trading floor, "Wolfman" was his name (forget who posted, sorry), he said that real inflation is 10%+ if using the same metrics used to gauge inflation in 1980. I think anyone who buys everyday products knows that the current inflation rate is much higher than the Fed will admit. Bread, milk, eggs, cereal, coffee, packaged meat, etc., etc., have all skyrocketed in the past 3 years. Hell, the Taco Bell meal that I have been buying on a regular basis for the past 2 years has jumped from $3.59 to $6.25! Exact same meal. UKDNY, is CVX getting close to the end of the green cloud? I think the CVX specialist is up here lookin for me.....but I got my camo on. Bob_E, you are the CVX specialist. I just find that Ichi Moku kind of interesting because it appears to be pretty accurate and shows a timeframe also. I have devoted some time to study the behavior of the AAPL stock and AAPL options, the weekly options casino in particular (as this is certainly making some people very, very rich), and found these two interesting articles. Pay attention to the dates, as the first is from early last week and the second was published yesterday. Well thanks fourrunner, but I'll beg off the "specialist list" I've asked the good doctor many times what he thought about CVX as Itchy applies myself. I really like the way CVX trades and it's adhered to a number of EW rules/guidelines. But good lord knows the "herd" can throw a monkey wrench into the gears at any moment. I have my stops and my risk/reward numbers, so I'm sittin back watchin. Wanna a beer? FYI: I just sold off some SSO that I bought when the market gapped down on Monday. Feel free to take this as an indicator of higher prices to come -- I kinda do, but a target is a target. Looks like the doctor is out right now. If someone tells a good dirty joke on the floor of the NYSE, we will hit the bear KO level at $spx 1392.76 at the close. ES futes are about 4 - 4.25 below the cash. Too bad I didn't buy that call on CVX a couple of days ago. It would have worked out really well. I'm still waiting for the chance to buy some more puts. It should be coming up soon. I'm not sure how earnings might play into things though. Earnings are a strange thing. I've been holding a call for awhile on GLW and they reported today, and the stock took off. It may be in a new wave 1. Take a look at it if you get a chance and see what you think. hmmm ... we'll have to wait to see - ED into close?! I don't think I've ever seen ES hold razor flat like this from 4:00 to 4:15. Interesting! This guy bought AAPL calls 660 three days after AAPL topped out at 644. Had he read Katzo's post calling for AAPL top at 636-639 the day before AAPL topped out, he wouldn't have done it. BTW, Katzo did a great job calling AAPL top and bottom. Katzo's targets were the closest to actual AAPL top & bottom among a couple of EW gurus that I've seen. K7 what did you make out of this mess today? I got a sense that it has a little punch left to the upside but the path of least resistance is down. we got one ... SPX 1390.68 NDX is right there too, 2709.62... how high I wonder.? good evening LW3, that is Such a nice wave, straight out of the text book. Be interesting to see how far she goes. Anyone seeing this ending triangle in INDU.? If it is then tomorrow will see it finish the last few minor waves of 5 of 5 then kaboom... down we go. How about an ending diagonal in INDU, takes another week, ? 10 days.?.. to a new high. I like it, but could be wrong, time will tell. Dumb question of the week for you kind sir.... What's the difference in the ending triangle and it's move lower and the ending diagonal taking it higher? I think the expanded flat is prolly right. Should head to 1395-1408. Think there's at least one more 4th down and 5th up still in it -- possibly two. No apologies necessary PL. Support the family first and foremost. i bought the F&P back in the early 80's been hooked ever since. i like your ending diaginal becauce im short lol. however C wave of of flat should excede A wave high. would also flush stops over A top. buying B/O hasnt worked. so your count might just be right. A question for you on the RUT if you have the time/inclination: It looks like we got your (4) at 11:21 on 4/24, is it possible that the (5) failed at 2:30? is there an auto refresh on this thing???? No. The best way to get continuous updates is to subscribe by e-mail. There's a link at the bottom. I'm just getting into flats (again) in the F&P. I do believe my EW education will require lots of highlighting, dog-eared pages, ruined eyesight, and sleep deprivation...but it'll be worth it. looks like we're finsihing up this a zz with a ending diaganol that was on its fifth as the market closed but will only take us up to 1393, not quite high enough for PL's target, but exactly equal to A. So, I'm thinking its looking like it could be a double zig zag for this c finsih up to 1393 in am or o/n. 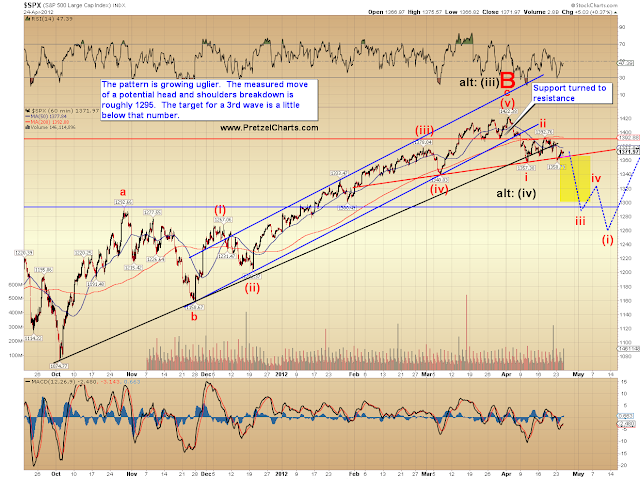 then down to 1377 for the X, then back up to PL's target range. anyone know the normal c length compared to a besides equal? 1.27 and 1.61 are both right near channel resistance. c=1.61xA brings us to 1411, touch the underside of the oct-april uptrend line and the top of this wave 2 channel we're in now, simultaneously on tuesday. any input of any kind, especially the fibinocci ratios used. BTW: it (e-mail update) appears to be buggy from time to time. Also: today/tonight is one of the quietest I've seen in quite awhile. OK, an expanded flat - is there any consistency to how these end up? No apologies necessary. You have your hands full - we will muddle along here and see if we can't collectively sort it out. hey pretzy i hope you're holding up ok. my thoughts are with you. here's a slightly different view of the world as we know it. Diagonals are motive waves that go in the direction on the larger waveform. Triangles are corrective that go opposing the larger waveform. As far as I can tell, their structures are very similar. The difference is a matter of personality and their place in the world. A diagonal, each odd wave (1, 3, 5) will have successively higher highs/lower lows, and wave 3 cannot be the shortest. Triangles will tend towards a sideways resolution. Hope that helps. And hope I got it right haha! Sorry I got out of the loop for a while my friends. Just finished an episode of "no freaking power for the past 36 hours". Words cannot describe how much smoke was coming out of my ears two hours ago. But now my blood pressure is back to a very healthy normal and I once again feel like I own the world. But in order to regain that feeling that I'm at least in control of something I had to buy an ant farm today. So that's what I did. Tomorrow I'm going to pretend it's world of ant-bankers and I'm going to flush the whole god damned thing down the toilet. After I've poured sulphuric acid all over and let that soak in for a few hours before I set it on fire and then put the fire out with my own personal stream of yellow water. Normally I'm not quite that violent but the local power company has this nasty habit of turning me into an angry violent monster every once in a while, lol.. I just hate being out of the loop like this and it's really amazing how lost a person feels "left behind" the information stream. 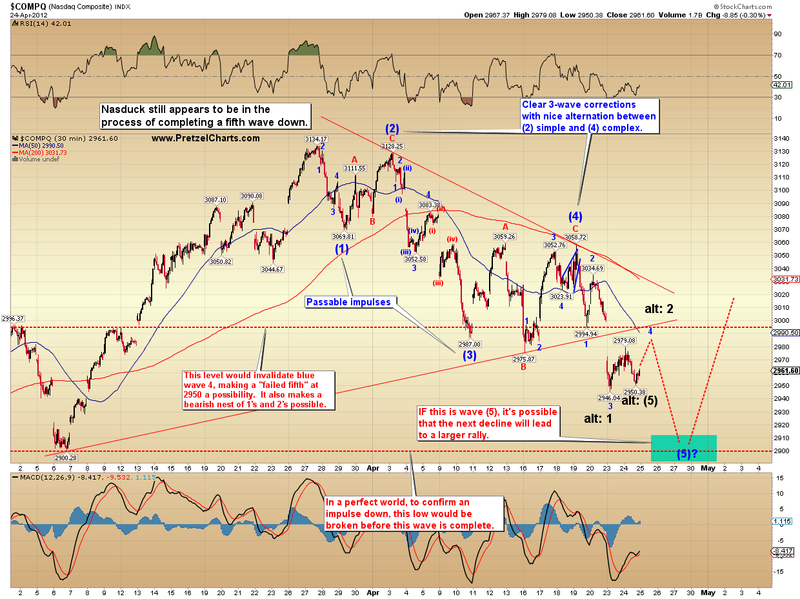 But just for the hell of it, I'll submit this wave count that shows both bullish and bearish scenarios as I see it. As always, please take my wave counts with a huge helping of salt. The bearish count is in pink and the bullish in blue. Both are entirely possible in my opinion. Having submitted this though, I have to admit that I'm seeing a few things on the market internals front, particularly NYSI (based on NYMO) that is showing something potentially "very" bullish. If that's what's really happening then we're very likely looking at just the first wave of 5 heading higher. If that's the case, the idea about "sell in May and go away"... forget it. I don't want to get into a discussion of my views on the world on someone else's comment section, but I'm just going to state for the record that I think this guy is a wacko. yep, that is always the question. Could have been the bottom for some time or just an a for a zigzag. But always a good sign for at least one more high, and there you can make a little money out of it... or now one could take the stop now over entry level. eur/usd has confirmed the ending diagonal I mentioned yesterday and is now breaking down. See chart -- this is textbook, and my confidence in this trade is very high. Trebek...We meet again...I'll take "Months That Begin with Feb" for 1000. UK back in recession. FTSE reaction? gap up and 50% surge in 30 minutes, madness. INDU was 13,139 and SPX 1,396.3 overnight so you should see some action after the open. Rules out 4th wv triangles but ending diag INDU still alive, see what PL makes of it when he posts, really in an ideal world this should all top out today/tomorrow and we set off down. Be sooo nice. Ya know, the more I look at this thing... I'm not even sure it's a c-wave. No clarity beyond the next 10 minutes in this market right now. yep, in a bear market they end up as a 5wv stroke up just higher than the 'a' wv top (usually) then the move is down in a 5wv impulse, every time. From a completely pseudo-philosophic standpoint...how the heck can an economic system continue to be an ongoing concern when it is judged "positively" by the potential for debasement of its underlying currency?...or am I just completely misunderstanding the whole thing (which is always possible). did that overnight no problem in SPX and INDU, so today you should see the 'proper' market do the same and then whoooosh. Thanks man - really appreciate you popping in here while handling all else. Hope everything and everyone is doing better on your end. I'm probably letting my repressed bias get in the way of my thinking, but yesterday's market behavior just seemed "wrong". Like a suckers rally...dunno. That is text book with the throw-over. EW4 just was put it at 86+ area, EW5 tgt 82.50 to .75. If 82 breaks then my T3 comes into view. You forgot to break out the magnifying glass for the ants. But you should consider a kilowatt of solar panels as backup for the absolute necessities. Even our cell towers were out last time we had a power outage for 5 days. It is extending out of the channel on both sides (a megaphone pattern) to about 3 ES points 93-4 up side now, to 82-3 downside). This is where the mrkt finally 'shakes itself to death' in the megaphone pattern (expanding triangle) and many get hurt. Levels where to buy and sell and cover for ST players have to be spot on. Or step aside. Pretzel, may the peace of the Lord that passes all understanding descend upon you and your family by the fragrance laden Hawaii breezes. You have our continued well wishes and support. Off to work...good trading everybody. Have you guys got Banks like Barclays? Recent scam is to sell £1m hedging instruments to shop owners who can't speak English to cover a loan, to protect against interest rate moves. They then manipulate LIBOR to trigger penalties on the hedge, resulting in massive penalty payments equal to a large fraction of the Loan and even larger penalties if those with the loan want to pay off earlier. Being sued as we speak, lots coming out from the woodwork. Excellent. This is the Bank with 2 Branches in the UK and 2,600 (you read that right) subsidiaries in the Cayman Islands, in that building the size of a duplex I mentioned before. (I love the Caymans, best Caribbean island. Period. IMHO) Bankers eh? Don't you just love 'em?